Today’s datacenter networks are not like this. In fact, while application turn-up on virtual compute platforms takes only minutes, network configuration to support those platforms can take weeks or even months to implement! At Nuage Networks™ we’re dedicated to fixing that problem. Our innovative Nuage Networks Virtualized Services Platform (VSP) removes the constraints of the datacenter network so it too can operate at lightning speed. 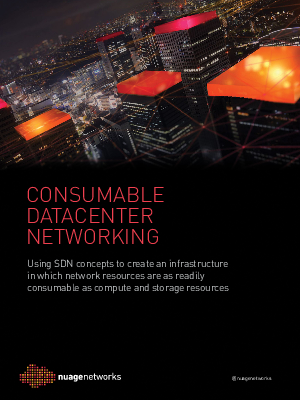 A Software-Defined Networking solution, the Nuage Networks VSP enables you to build a robust and scalable multi-tenant networking infrastructure that delivers secure virtual slices of readily consumable compute, storage and networking instantaneously across thousands of applications and user groups.